The most audacious, death-defying…Ella Zuila? Nobody knows her – but she was the most famous Australian public entertainer in the world in the last two decades of the 19th century. Like her near contemporary and compatriot Nellie Melba, she assumed a continental-sounding stage name, but unlike the great diva we don’t know her real name. A striking-looking athlete of astounding physical prowess, Ella was in her day the world’s most famous female circus wire walker or aerialist – the toast of enraptured audiences across Europe and north America. The extent of Ella’s fame and prowess have emerged through a research project of La Trobe University senior lecturer in Theatre and Drama, Dr Peta Tait. A theorist in performance studies, Dr Tait set out to examine bodies and gender identity – how society views the human body in a cultural sense. Her research led her to examples in comparatively recent history where females began to match the physical prowess and bravado of males. These examples occurred frequently in circuses, hugely popular public entertainments that came into their own in the second half of the 19th century. The creme de la crème of circus performers were the aerialists – and Ella Zuila was the best! ‘Men were supposed to have the muscular bodies. They performed public feats of strength and daring. Imagine the effect on staid Victorian-era public perceptions of the female body when women aerialists like Ella broke down, for the first time, the perceptions of the ‘natural’ difference between male and female bodies,’ Dr Tait said. ‘Ella was a sensation. She matched and often excelled the daring feats of male aerialists’. 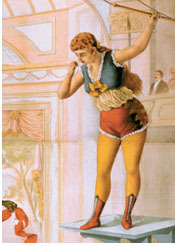 At the height of her fame in America in 1881, drawings of her act show her wheeling a child over the wire in a barrow, carrying on her back a man – probably her aerial partner, husband and manager, George Loyal – pouring water from one vase to another held over her head, walking the wire sometimes on stilts, sometimes with baskets on her feet. And she could do some of this blindfolded! There is also a drawing of her, hanging by her knees catching Loyal who had been fired at her from a cannon. Reconstructing Ella Zuila’s act and touring schedule, Dr Tait has spent many hours in the British Museum’s Collingdale Newspaper Library, Westminster Public Library and the circus archives of the Theatre Museum. Despite this, she found only minimal biographical details about Ella whose background in Australia remains unknown. When she died on 30 January 1926 at Walton-on-the-Naze, England, Ella’s age was given as 72, indicating she was born in 1854 somewhere in Australia. English aerialist and human cannonball, George Loyal arrived in Australia in 1868 and performed in Melbourne and Sydney. He probably established a personal and professional relationship with Ella in Sydney. The Sydney Morning Herald of 22 March 1872 carried an advertisement for Ella’s performance as a gymnast next day at the Royal National Circus in Sydney. And according to the American circus industry publication, the New York Clipper, Ella, in 1876, rode a velocipede across a 500-foot long wire, 368 feet above the Magani Falls, near Pietermaritzburg, capital of Natal, in South Africa. She probably worked in London during 1877 and 1878 and performed in the USA in 1880 and 1881 at Adam Forepaugh’s, the largest circus at that time. Ella was to remain a major aerial star in London and Europe from 1885 until 1904, with Loyal astutely managing the act. When Ella’s fame was at its zenith she was performing to thousands of people at the Crystal Palace, Royal Aquarium, Canterbury and Paragon theatres in London and touring Continental Europe from 1886. Her career came to an abrupt halt on 26 August 1904. While riding a bicycle across a wire at the Rotunda, Dublin, she fell. She was so badly injured she could not perform on the wire again. 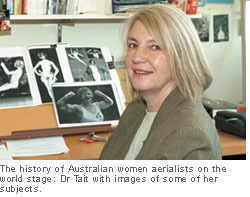 Dr Tait’s extended research covers the history of aerial performance and Australia’s contribution internationally. The project involves interviews with Australia’s 13 major female aerialists, including the mother and daughter combination of Nicki and Bekki Ashton of the famous circus family. Bekki is still performing the triple somersault, the first Australian-born flier to achieve this difficult trick. Dr Tait also interviewed Dimpie St Leon who performed on trapeze throughout Australasia from the 1920s to 1950, and Mary Gill who began her trapeze career with Ashton’s Circus in Australia and starred with Ringling Bros, Barnum and Baily in the USA for 12 years until 1973. Reprinted from the La Trobe University Bulletin with permission. Thanks to Professor Peta Tait for the added references. 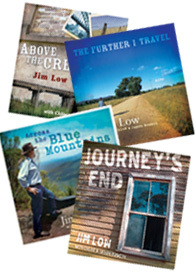 Professor Tait is Chair in Theatre and Drama at La Trobe University in Victoria. Tait, Peta. ‘Circus Bodies: Cultural Identity in Aerial Performance.’ London Routledge, 2005. pp.50-1. The Australian Marvels: Wire-Walkers Ella Zuila and George Loyal and Geographies of Aerial Gender Body Identity. In ‘Playing Australia’, edited by Elizabeth Schafer, and Susan Bardley Smith, Amsterdam: Rodopi, 2003. pp. 80-92.